Alexander Andreev in his section called Stunt Review talks about his new motorcycle Harley Davidson XR1200. Harley stunts aren't new, but the XR1200 is an interesting model. The Americans tried to make a sport bike based on a heavy Sportser: the base was shortened, the steering was redesigned with a new progressive fork, the center of gravity was shifted due to the longer suspensions and the new swing arm, and wider sport wheels were mounted. That way he got a sportbike weighing under 300 kg with a highly torque V-Twin engine. The XR1200 is the only Harley which allows full stoppies, which is why Alex chose it. A standard fork is enough, but the brakes had to be upgraded - this is the only significant modification. Rear suspension, wheels, frame, engine, transmission - everything is standard and works fine. Even a handbrake is not necessary, because the tank can not be flattened to do wheelie in tank positions. Spins can be made with foot brake. 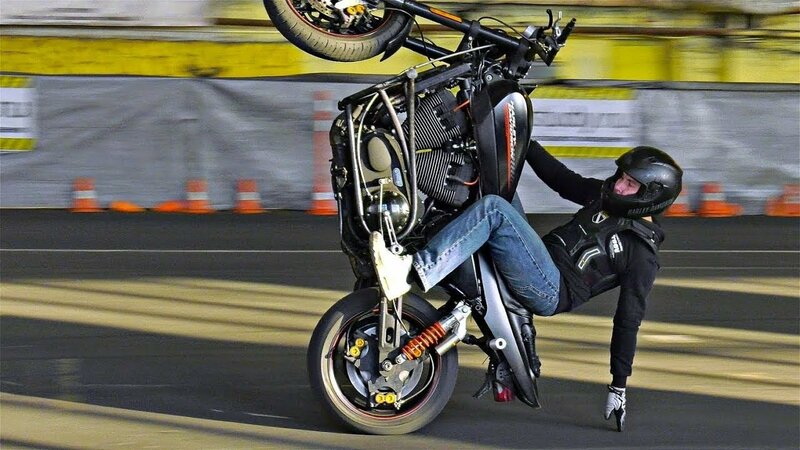 Of course, even basic stunts on such a heavy non-standard motorcycle are not easy to do - you need some skills for that. But Alexander Andreev performed well even on a bad surface in the hangar: stoppie 180 with kangaroo, powers, scrapes, grabs, deadspin on the rear wheel, christ and switchback coffin zero, and drift with exit to wheelie.